I’m here to give brief remarks about Jose Maria Sison’s new book, Crisis Generates Resistance. A collection of selected writings between 2009 and 2010. Volume 1 of the series: “Peoples Struggles against Oppression and Exploitation”. The book covers a wide variety of subjects, ranging from the global financial catastrophe brought on by monopoly capitalism, the sharpening of contradictions in the world, the neoliberal policy in education, repression and human rights in the Philippines, the important tactical and strategic questions in the Filipino struggle, but also solidarity statements with the international anti-imperialist womens’ movement, with Palestine, Haiti, the Tamil people’s fight for self-determination, and with all the peoples and workers of the world. This book does not just provide important information about these issues, but it also pushes forward a proletarian, anti-imperialist political line. A political basis on which to further organize ourselves. What is written here are not just reports, but should also be seen as being connected with and part of the revolutionary and anti-imperialist struggles waged in the world today. Without those, this book would not be able to exist. The release of Crisis Generates Resistance is very timely. We are at a time of worldwide imperialist onslaughts, a time when the racist and fascist movement in imperialist countries are gaining strength and are getting more violent every day. The need for anti-imperialist solidarity work is vital. All peoples’ struggles in the world are, after all, connected and interlinked. However, the best way to be in solidarity with anti-imperialist peoples struggles is to build a revolutionary pole in ones country. One which can actually politically or materially support our international freedom fighters against our common enemy. In a country like the Netherlands, we cannot yet say that there already exists such political representation. You could say that the revolutionary movement in the Netherlands for a long time has been in crisis. But as we have come to learn today, what does crisis generate? Exactly, resistance. This is only a matter of time… and painstaking hard work. 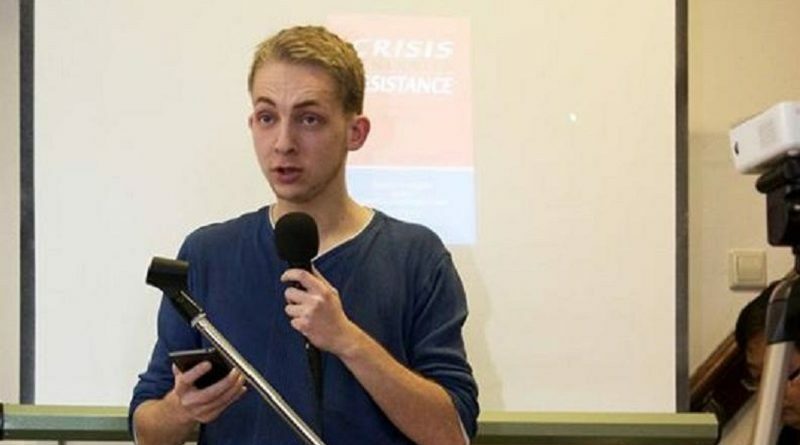 Militant youth has taken up the task to build and strengthen the upcoming revolutionary and anti-imperialist movement in the Netherlands today. And for us and our struggle, we can learn a lot from comrades like Leila, Luis, Joma, and from books such as these. Thank you for giving the opportunity to give these brief remarks. A red salute to the organizers, speakers, performers of the event. Everyone, buy this book!